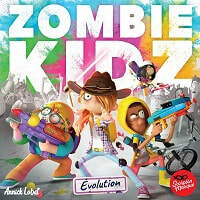 Zombie Kidz Evolution - Is the first "legacy"-style game for kids, with basic gameplay similar to the 2013 title Zombie Kidz — but things will quickly evolve! In the game, the young players are at school when zombies start to attack, infiltrating the entryways, then barring the way to classrooms. Players move through rooms and entryways to eliminate zombies and keep the zombie reserve full. If a zombie must enter the school but none are available, then the school has been overrun and the players lose. To win the game, players need to lock each of the four entryways as apparently the custodian has abandoned the post and given up the school for lost. As players get better, they can complete missions, track their development through a trophy-sticker system reminiscent of video games, and open envelopes that contain new material for the game, upping the challenge they face while also providing them with new powers and new heroes as well.